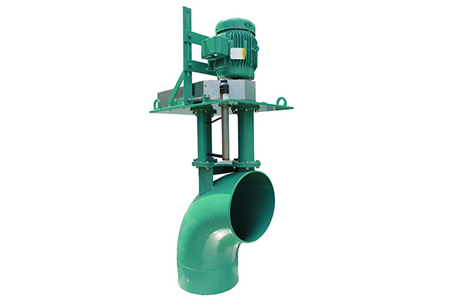 Vaughan’s Turbo Mixer is a propeller mixer mounted vertically inside an 18” elbow. This mixer has replaced many submersible propeller mixers which have experienced motor or gearbox failure due to fluid inleakage. The Turbo can mix a pit with only one foot of liquid above the floor, something a horizontal shaft submersible mixer cannot do. The Turbo also incorporates Vaughan’s upper cutter above the propeller to stop wrapping and fibrous material binding and to protect the mechanical seal. The Turbo has been used extensively in dairy manure mixing but also in municipal treatment plant anoxic zone mixing and in oxidation ditches. An optional add-on turntable can allow the Turbo to be easily re-aimed in the pit.